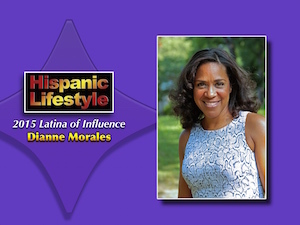 Dianne Morales is a 2015 Latina of Influence named by Hispanic Lifestyle. Dianne is being recognized for her professional accomplishments, commitment to education and community service. Hispanic Lifestyle’s 2015 Latinas of Influence will be recognizing Dianne and her fellow Latinas of Influence during a luncheon held in their honor on at Latina Conference 2015. Dianne Morales is the Executive Director & CEO of Phipps Neighborhoods. She is responsible for the overall fiscal and program management of this $18 million, multi-site agency providing a comprehensive network of educational, work-readiness and community development programs to more than 10,000 children, teens and adults each year in targeted communities. Dianne’s successes at Phipps Neighborhoods include the launch of the Career: Network Healthcare, an employer driven career exploration and training program operated by Phipps Neighborhoods in partnership with Montefiore Medical Center and Hostos Community College, which is helping young adults secure employment within the wide range of job types in the healthcare field. Another innovative program launched under Dianne’s leadership is Education Learning Initiative, which focuses on creating educational standards, facilitating the development of a progressive curriculum pipeline, and evaluating outcomes to ensure quality and continuous improvement of Phipps Neighborhoods’ education programming. Initially, this initiative focused on after-school and summer education programs for in-school youth, where it has successfully improved outcomes for participants. Phipps Neighborhoods has expanded these services to impact the out-of-school education programs. Additionally, as part of the Morgan Stanley Strategy Challenge, a team of business analysts from Morgan Stanley have recommended expanding this innovative initiative further in a fee-for-service model that will work with external education providers. Dianne has also been an instrumental leader in the launch of the South Bronx Rising Together collective impact initiative. This collaborative network of program providers and community stakeholders work together to create a community that is college and career ready by leveraging the expertise of a network of families, schools, business leaders, community advocates and service providers to support the lifelong success of families and youth in Bronx Community District 3. Prior to joining Phipps Neighborhoods, Dianne served for nearly five years as Executive Director of The Door, NYC’s premier youth development organization serving over 11,000 at-risk young people every year. Dianne is an expert in education and youth development, and has a wealth of experience in program development and nonprofit management. She’s spent over 15 years in program start-up, including the initial implementation of the NYC Department of Education’s Office of Youth Development and School-Community Services under Chancellor Joel Klein, the launching of The Teaching Commission, and the development of Jumpstart, a national early childhood non-profit organization. Dianne is a member of the Board of Directors for JobsFirstNYC, and serves on the Executive Committee for Human Services Council. She also serves on the New York City Community Schools Advisory Board, created by Mayor Bill de Blasio’s administration to advise on the implementation of his Community Schools Initiative. Among her recent awards, in 2014 the New York City Hispanic Chamber of Commerce honored Dianne at their annual Hispanic Women in Business Luncheon. Also in 2014, she was selected as a panelist for the YWCA’s prestigious Latina Leadership in the 21st Century panel. In 2013, the national Network for Social Work Management 2013 Exemplar Award for Excellence in Social Work. Dianne is a product of the American Dream. She is a Latina who grew up in Bedford-Stuyvesant, Brooklyn. Her parents came to New York from humble beginnings in Puerto Rico, where they lacked access to higher education. The support of her parents enabled Dianne to achieve academically, and do better economically than they had. She has focused her life on supporting communities in creating sustainable change for social and economic justice. She has earned graduate degrees from the Harvard Graduate School of Education and Columbia University, as well as a Bachelor’s in psychology from the State University of New York in Stony Brook. This originally appeared on hispaniclifestyle.com.